Posted on 29.5.2007 at 18.55. It’s a gorgeous summer day so I don’t have the patience for a longer post but I will mention these amazing new websites: the lovely and talented Tiffini and Romina have both opened their stores and it has certainly been worth the wait! If you haven’t done so already check out the art of these girls immediately at tartx and Alma for original and beautiful jewellery, accessories and much more! 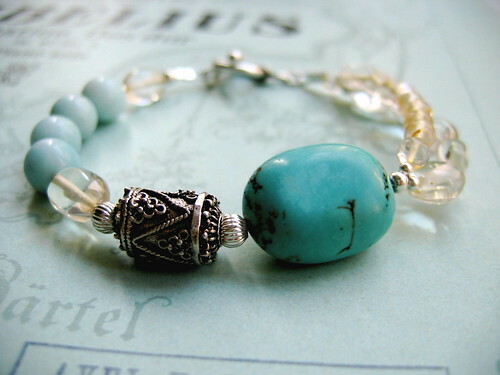 I like these mild colours combined with the strong turquoise and effectively patterned silverbead. Delicious! You are the sweetest person ever! You make the most amazing – gorgeous jewelry as well! That is just so beautiful! Well I adore Tiffinis art to pieces! And Alma’s work is a lovely discovery indeed! I’ve all ready commented on Flickr on your new work, but I’ll just say again how gorgeous these new pieces are!